8 Years Later Part 2 has arrived to continue the Spider-Family’s day at the fair, if only a little. While we don’t get much in the way of surprises here, what we do find is fun, fast, comic book absurdity that we all know and love from the Marvel Universe. Minor spoilers to follow. As we progress further into the new era of The Amazing Spider-Man: Renew Your Vows, it seems more like writer Jody Houser is attempting to create something that fans of this book can feel safe and familiar with, at least for now. This issue takes a page (or a few) out of the second issue by giving Mary Jane the spotlight. It’s a direction that I’m happy to see return for now because it puts emphasis on character interactions, which is the real reason we all love RYV. Yeah, three people given multiple superhuman abilities by the bite of an irradiated spider, genetic inheritance, or confiscated technology punching an overgrown lizard wearing a lab coat in the face is cool, but what I really loved in this issue was seeing MJ help Annie pick out her clothes as she prepares for her summer vacation to end. Give me more of that! 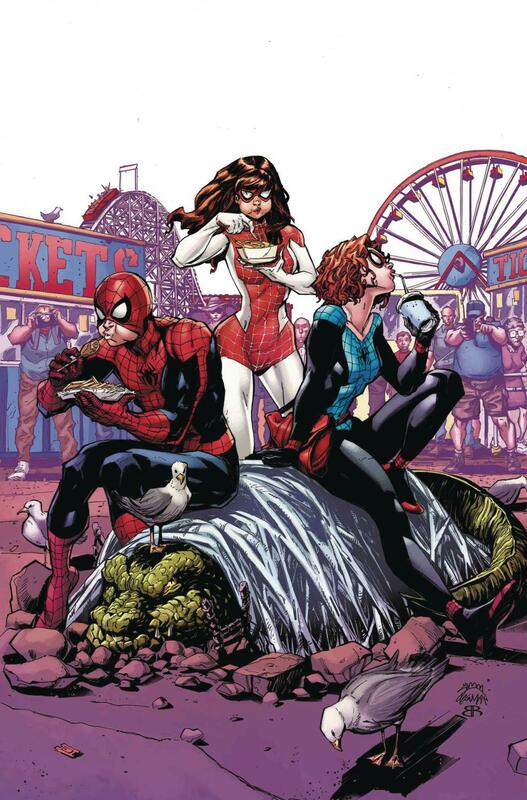 Likewise, a new creative team’s first arc on the book being about a family day at the fair turned super hero smack down is a decision that definitely errs on the side of caution, but is one hundred percent logically sound nonetheless. I imagine that they wanted to address people’s fears about the book right off the bat, and I still feel they’re doing that well. While the writing may have been just as good this issue as it was the last, I wouldn’t say quite as much for the visual appeal. On the bright side, each costumed hero looks great; artist Nick Roche makes sure all aspects of them (especially smaller details like webs) are noticeably consistent, which is something I can really appreciate. Spider-Man’s anatomy is usually well defined, and I especially love his appearance in the first panel of the first page, but I’m not sure what kind of pose he’s supposed to be striking on the very next one. He looks a bit like he slipped on ice and is trying not to do a split. It doesn’t look natural for him like his other positions do. Faces are good at showing emotion nine times out of ten, but that tenth time is when MJ and Annie are having a discussion and MJ looks like she’s drunk. The backgrounds are still surprisingly detailed; at the fair, French fries and large sodas dropped on the ground near a fight between the Spider-Family and the lizard are a subtle touch that helps set a sense of urgency that the crowd felt as it started. When MJ confronts two kids picking on another and is thanked for her help as Spider-Mom (man, I hope that name sticks), there’s trash on the ground. It’s such a small, simple detail, but it truly adds a lot of believability to the setting. It wouldn’t feel as real if these New York alleys didn’t have any trash lying around. Unfortunately, it’s a little hard to appreciate this attention to detail in this specific sequence. New York city should probably be more colorful than this. It looks like Ruth Redmond was pretty comfortable with a certain shade of green here, and in my opinion, a little more variety would have gone a long way.